Here’s a little break from all those Cherry Blossoms! 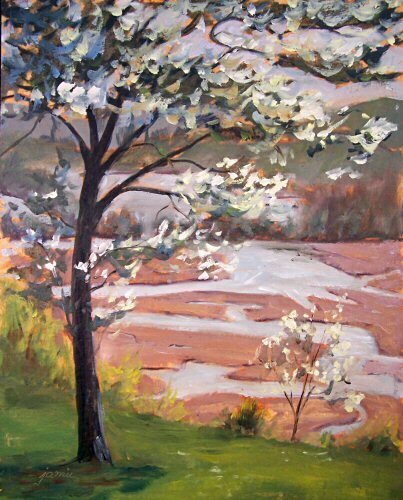 I’ve painted this Dogwood overlooking Constitution Marsh in its bright red, fall splendor nearly every year, but never in the spring flowering stage. The real challenge for me was to decide how I could best display those white blossoms against the very light blue sky. This painting is done on the new, mounted Multimedia Artboard. It is an archival support that can be framed just like a hardboard panel. I’ve enjoyed painting on this surface from time to time because of the way it takes both oils and acrylics. As the support itself is brittle, I back it with acid free foamcore for framing. They have just come out with a new version of the product which is already mounted on the foamcore, making it more durable for travel purposes while maintaining the lightweight benefit. For small paintings, I sometimes feel the weave of canvas interferes with the painting. As you can see here, the smoother surface of Multimedia Artboard allows me to work without that concern. I don’t feel I need to fight with unwanted texture. I tend to like fairly absorbent surfaces. I can put more paint onto them, and avoid some of the streakiness of slick surfaces. I give the Multimedia Artboard a coat of Golden Matte Medium diluted 20% with water to cut down on just a bit of the absorption. The paint applies beautifully to the surface. I’ve used it now for both oils and acrylics, and highly recommend this archival material. You can read about the product at www.multimediaartboard.com. You can order it by writing to the company through the link on the website. I’ve put up a link to the site from the right sidebar on my blog too, so you’ll always be able to find it here. Today began with a light haze, giving a silvery glow to the atmosphere over the Hudson River. The cherry blossoms are in full swing at Boscobel, and the reddish color is coming into Constitution Marsh as it springs back to life from winter dormancy. My apologies for the slight glare on the left side of the painting. I’m a terrible photographer. That glare is only in the digital image, and not on the painting. $440.00 plus $20 shipping and insurance within the Continental United States. For local sales, shipping charge will be allocated to NYS Sales Tax. Please email me at JamieWG@aol.com for International purchases or with any questions. For the past several days, I’ve been craving a painting day up in the Catskills. I loaded all my gear into my car this morning and drove up to do this painting this afternoon, then turned around and drove back. It was worth the trip for the exquisite weather, spring buds on the trees, and beautiful mountain views. 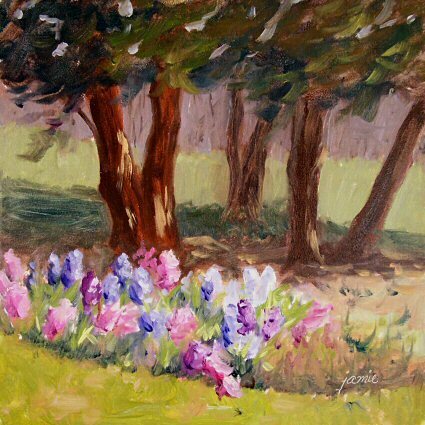 The grass was shimmering in the sunlight, and I could hear the rushing of a waterfall as I painted. I need to get better at tree identification. I don’t know what kind of tree this is in the foreground. I know it’s not a maple because it doesn’t have those rich, red spring buds. I love the twists and turns of the branches, and the trunk glistened where the light hit. That’s South Mountain in the background. I didn’t feel like straying far from home today, so I set my chair outside in the yard and took in the first blooms of spring under the stand of evergreens. My little dog kept me company, the temps were in the high 40s, and the sun was shining. It’s hard to ask an early spring day for more than that! I’ve been peeking at these hyacinths from the window for a week or so, and I’m glad I got to paint them before they disappeared for another year. Today was heavily overcast, with showers predicted. 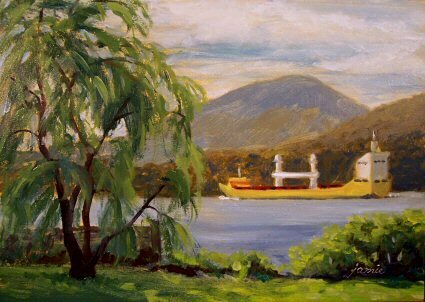 I had a hard time deciding whether or not head over to the Hudson River to paint at Boscobel. 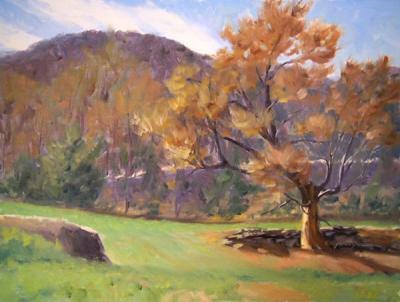 In the end, I figured that any day of plein air painting is better than a day without plein air painting! For my efforts, I was greeted by this striking yellow sky, and extremely dark blue background hills. I’ve done many, many paintings of this view, but have never seen it quite the way it looked today. Boscobel Restoration is in Garrison, New York, along the Hudson River. The view overlooks Constitution Marsh and West Point Military Academy. This painting will be sent beautifully framed in a gold, wood frame and ready to hang. If you’d like the painting unframed, please contact me. I found four gorgeous gold wood frames for miniatures in an art store, and am doing some paintings for these beautiful frames. It may sound a little bit backwards, but it works! The painting size is 3×5″, and with the frame it is about 6×8″. 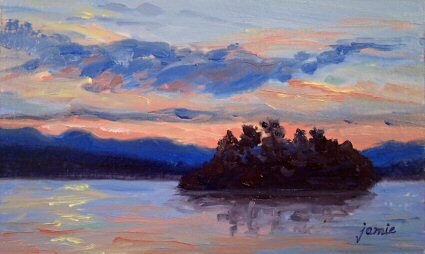 This painting was done from a photo I took on a Lake George sunset cruise. 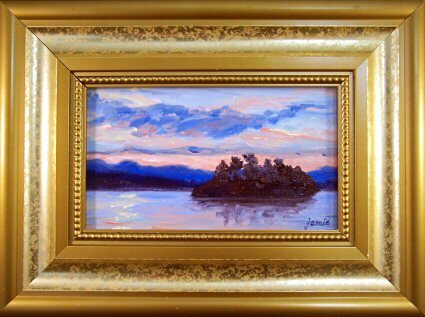 The colors were just magnificent, and the little islands in the lake provided the perfect silhouetted foreground elements for the colorful backdrop. Here is what the frame looks like with the painting, though I think the painting colors above are more accurate. This is the 400 year anniversary of Henry Hudson’s voyage up the Hudson River. 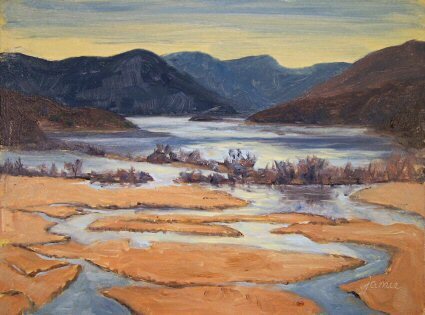 I am doing a series of Hudson River paintings to commemorate that event, and this is the first! This fabulous, huge yellow ship came down the river past West Point as I stood on the shoreline in Garrison snapping photos. 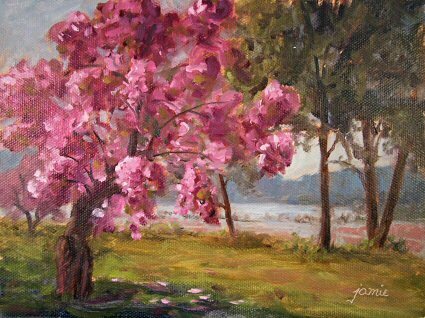 Some of the works for this series will be done en plein air and some will be from photo references.